Williams Interactive has been around for a long time, specializing in arcade slot machine games. 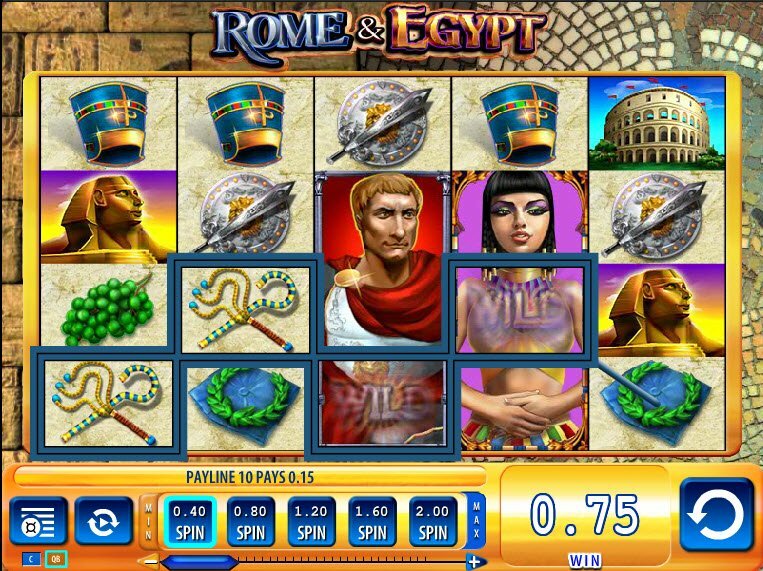 Like most of their games, the Rome & Egypt Slot actually started out as a slot machine for brick-and-mortar casinos. It’s crossover to the internet makes a great choice when playing slots at online casinos. If you’ve played enough online slots, by now you’ve probably come across enough themes based on either the Roman or Egyptian empire. These popular slots tend to blend together and seem repetitive after a while. Actually, the Rome & Egypt Video Slot sets itself apart from the rest, especially for all those fellow history lovers out there. Instead of focusing on just Rome or Egypt, the game references the famous affair between Ancient Rome’s Julius Caesar and Egypt’s last Pharaoh, Cleopatra. It’s sort of a hybrid of those two themes already popular among slot players. Cleopatra has earned her place in history as a famous enchantress, reknowned for her beauty and ability to enchant men. She seduced not one, but two Roman leaders, Julius Caesar and Mark Antony. This femme fatale was more than just beauty. She also spoke nine languages and had excellent math skills. In a way, the Rome & Egypt Slot retells the love affair between Cleopatra and Julius Caesar. Reel images contain recreations of the two famous historical figures along with all those clichés from Ancient Rome & Egypt like grapes, pyramids, classical buildings, etc... you get the drill. 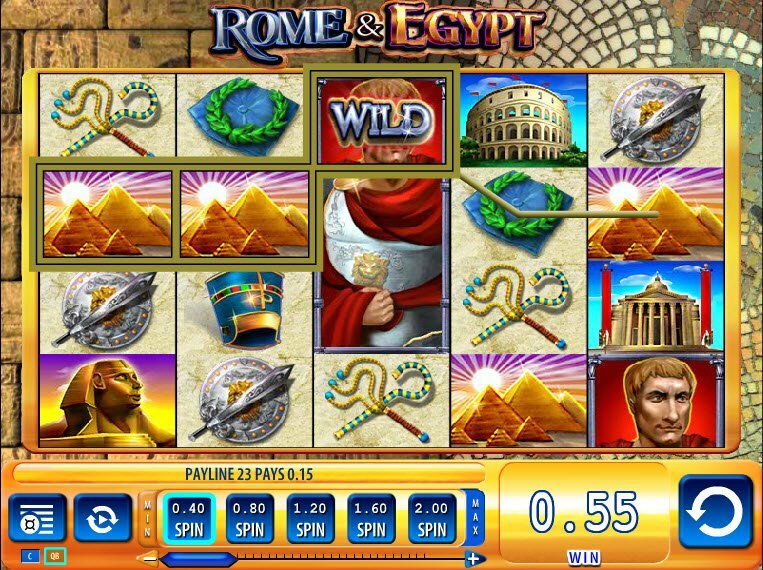 In terms of graphics, the Rome & Egypt Slot Machine look pretty good in colorful, 3D quality. The background music could compliment the theme better, but overall Williams Interactive did a nice job designing the game. 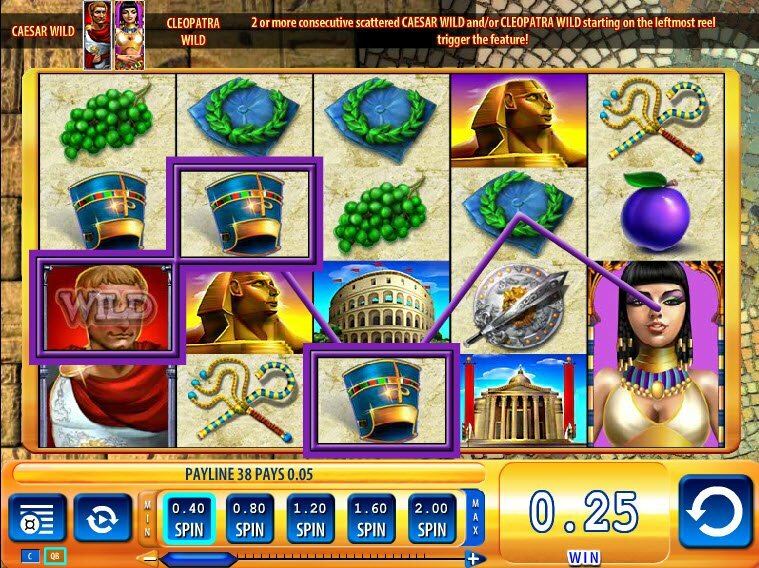 2 or more consecutive scattered images Cleopatra or Caesar Wild symbols trigger the Free Spin Bonus. The Rome & Egypt Bonuses include some impressive features. First of all, the game contains not one, but two Wilds represented by Cleopatra and Caesar. These both substitute for all other symbols. Typically, video slots only contain one and they don’t always substitute for every symbol in the game. 2 or more consecutive scattered images Cleopatra or Caesar Wild symbols trigger the Free Spin Bonus. In addition, the game contains 40 paylines, a high number in compared to other games.